Through out the summer the media campaign falsely depicting Jeremy Corbyn as an antisemite has been significantly stepped up. The principal objectives of the current campaign against Corbyn are to remove him as party leader, to discredit the Labour Party and make it incapable of winning an election, or create the best ideological cover for the right to split from the Party and try to prevent Labour winning an election. This has become more urgent for Labour’s opponents because Labour’s current popularity with voters means at present it could win a general election. Recent opinion polls (see for example here, here and here) indicate Labour support is level with, if not higher than, the Tories. The multiple attacks on Corbyn are heavily promoted by almost the entire media, including the state run BBC. A selection of this propaganda is set out in this Jerusalem Post article. Some other elements in this campaign include a Times editorial describing Corbyn as ‘straightforwardly antisemitic’ and calling for his removal from the Labour leadership and Jonathan Sacks, the former chief rabbi, accusing Corbyn of making the ‘most offensive’ remarks by a senior British politician since Enoch Powell’s notorious 1968 ‘Rivers of Blood’ speech. It is even claimed that a Corbyn-led government would pose an ‘existential threat to Jewish life in this country’. Views that an entire group of people is inferior, or has negative characteristics, due to genetic, cultural, religious or some other feature, are the basis of all forms of racism. Such reactionary ideologies have been used to justify the greatest crimes in history – including the Holocaust, the slave trade, the extermination of the original inhabitants of the Americas and Apartheid. These types of ideas developed deep roots in Western culture and today are drawn on to demonise Muslims, to mobilise opinion against migrants and black people and to whip up antisemitism. Hostility to a group because of its inherent genetic, cultural, religious etc character is different to opposition to a specific ideology or membership of a political movement, for example fascism, (or in the case of the view of the right communism), which is based on its ideology or political structures – and is quite independent of a person’s ethnic, religious etc character. Thus, for example, being a white Southerner in the US is not the same as being a supporter of the Ku Klux Klan, membership of a ‘jihadist’ terrorist organisation (ISIS, Al Qaeda) is different to being a Muslim, Zionism is different to being Jewish, historically being a Nazi is not the same as being German. In Europe the cutting edge of the populist right’s politics is its racist campaigns, mobilising public opinion against migrants and Muslims, and also against Jews – Poland and Hungary are explicitly promoting antisemitsm. In Britain negative views about migrants and Muslims have reached all time highs in recent years, and prejudiced views about Jewish people have also been rising. According to the Institute for Jewish Policy Research (IJPR), antisemitic ideas can be found at varying degrees of intensity across 30 per cent of British society. As the IJPR points out, in the sphere of politics the extent of antisemitism is highest on the far-right, not on the left – but what stands out on the left is the level of its opposition to Israel. It is these left wing views on Israel, held by supporters of the Palestinians, that are the focus of attacks on Labour’s leadership. The possibility of a Labour government in Britain is a serious concern for Israel, given Corbyn’s outstanding record of support for the Palestinian liberation struggle. Prime Minister Benjamin Netayahu’s public attack on Corbyn this month, for attending a memorial for Palestinians killed by Israeli bombing, indicates the importance of this issue. Feldman’s views should be roundly rejected. Clearly Judaism, which is a specific monotheistic religious belief, and Zionism, which is a belief that a state should be created based on that religious belief, are not at all the same thing. 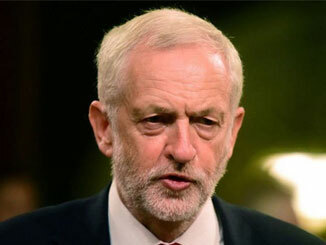 Labour’s National Executive Committee, which is due to meet on 4 September, is being pressed to abandon the code of conduct on antisemitism it adopted in July and replace it with the 2016 International Holocaust Remembrance Alliance (IHRA) Working Definition and its eleven examples. Supporters of Israel look to this very specific, recently drawn up, definition so that the case can be made that supporters of the Palestinians are antisemitic. Long-standing definitions of this reactionary ideology, that are based on what views people hold or express about Jewish people, do not aid that purpose. For example the Oxford English Dictionary, which defines antisemitism as ‘hostility to or prejudice against Jews’, does not assist the attacks on Corbyn. Israel has been waging an international campaign to re-define the concept of antisemitism, to include various expressions of opposition to Israel. The IHRA Working Definition, particularly if it is accompanied by all its purported examples, is being deployed to condemn supporters of the Palestinians for their views about Israel and Zionism. This was never the purpose that informed the actual words that were chosen for this text. Kenneth Stern, its key author, drafted a definition to assist in the collection of data. As he informed the US Congress in 2017 the IHRA definition was never intended to place restrictions on expression of views or for punishing political speech. He also explained why he opposes the misuse of the definition and drew attention to the damage this misuse does. It is clearly not appropriate for inclusion in any code of conduct. The IHRA definition enables antisemitism to be conflated with criticism of Israel or of Zionism, as Stephen Sedley, a former appeal court judge, has pointed out. One of the IHRA examples suggests that claiming the existence of a state of Israel is a racist endeavour amounts to antisemitism. The many Israeli laws that enshrine Jewish supremacy over Palestinians, including the July adoption of the Jewish Nation-State Basic Law, are clear evidence of Israel’s institutional racism. As Liberty, Britain’s leading civil liberties campaign, has warned, the IHRA examples risk ‘undermining’ the fight against antisemitism and pose a ‘threat to freedom of expression’. Its AGM this year urged public bodies ‘not to adopt the definition’. The Labour NEC in July included the 38 word IHRA definition along with most of the accompanying examples in its code of conduct, which can be read here. It is clear that the parts of the IHRA definition which Labour did not accept, and which it is proposed by the right to do so now, are an attempt to ban criticism of Israel – that is why the right wing and Israel wants them adopted. This is clearest in the example that antisemitism is ‘claiming that the existence of a State of Israel is a racist endeavour.’ This clearly is quite different to antisemitism. The founding of the state of Israel involved ethnic cleansing – deliberate driving of the Palestinian population from their homes by terror. It continues to discriminate against Palestinians in its settlement policy. It has now even incorporated religious separation in living into its law. This is clearly racist. But this is not a collective or specific feature of Jews – there are Jews who oppose either all or some of these steps, and there are non-Jews who support such racist measures. Such racism is therefore created by a specific ideology, most forms of Zionism, and not by Judaism. Opposition to such measures is not, therefore, opposition to Jews but to a specific ideology. But not only is adoption of the erroneous points of the IHRA wrong in content and principle, but it is also bad tactics. Adoption of the wrong parts of the IHRA will not stop the attacks on Labour and Corbyn, because the aim of these attacks is to stop criticism of Israel, not antisemitism. It is completely unacceptable to the leadership of Israel to have a potential prime minister of a major European country, Jeremy Corbyn, who supports the Palestinians and opposes Israel’s massacres, oppression and discrimination. Therefore it is a total illusion to believe adoption of the IHRA Working Definition and all its examples will stop criticism of Labour and Corbyn. On the contrary, by creating confusion and signalling a right wing victory, it will increase these attacks. Adoption of the wrong IHRA examples will not draw a line under the issue. to point out clearly that the erroneous parts within the IHRA examples are designed to stop criticism of Israel and not to stop antisemitism. As Israel’s policies are not popular in this country and become less so after each massacre it carries out, this is the way to clarify the political issue and deal with potential attacks. to resolutely exclude from Labour all real antisemites, that is those who oppose Jews as opposed to Israel’s policies and Zionism. Labour does need to be able to tackle antisemitism where it exists. It should also defend itself and its leadership against false allegations. If Labour’s NEC revises its code and adopts all the IHRA examples, it risks making it more difficult for it to defend itself and Corbyn from unfounded charges. The driving forces behind the campaign against Corbyn are not going to moderate their attacks if Labour makes more concessions. Quite the opposite, they will continue becoming more emboldened. Their aim is to make sure there is never a Corbyn-led Labour government in Britain. The left needs to unite to effectively defend that prospect.